1975, what a year! The Kool-Aid man started appearing in some TV commercials! and TVS in Australia even started broadcasting some color! The betamax was released. In 1975 the ring tab beer and soda can design was discontinued (and was previously used in wide variety of crafts!) Two true classics came out, in music, Bohemian Rhapsody, and in theater, Rocky Horror Picture Show! You may have been carrying around a pet rock, while wearing a mood ring. And on tv you may have been watching All in the Family, Sanford and Son, or a personal old favorite of mine, Rhoda! In March specifically the Eagles, “Best of my Love” was number 1 when this issue arrived in the mail. Dog Spectacles were patented in England (fascinating!) but the Workbasket didn’t offer overseas subscriptions, so there were no dogs wearing their spectacles while laying at the feet of their owner that was reading the magazine. There’s also a very good chance people around you were talking about “two all beef patties, special sauce…” To this day, you can ask my Dad and he will tell you right away what is in a Big Mac. True story. This issue is a good bit shorter then the massive February issue, about 20 pages less. So there aren’t as many projects to choose from. One item I was glad to see was a “Cardigan for Larger Sizes” because so many old patterns make tiny clothes! Though I don’t think I’ll be making it this month, it’s nice to have the pattern tucked away. I do intend to make these placemats, though I’m going to make some pattern modifications, which I’ll share with you. I already started a sample and just wasn’t happy, so I’m go to redo this pattern with a standard worsted weight cotton, and I’ll post my pattern. Easter is in April this year, which aligns well because the Women Who Make Cents column, and one cooking section both cover Easter items. And there is also this Easter Egg craft that I do hope to make. Every month there are SO many projects I hope to make, the Workbasket really is just chock full of them, and I never get them all done. It’s a shame really. Hopefully I’m not setting my sights to high again this month. There is also a basic slipper pattern I hope to make, and I don’t intend to make one, but this toddler vest is SO 70s I just had to share. I actually made a vest like this as a teenager (in the 90s) because I ADORE granny squares. Also this issue features two ads that just crack me up! It is unnatural as this boldly proclaims, and I love that it is “Hair off face.” Not “Get the Hair off Your Face,” even though it could fit if the ad was designed differently. You can be “Now Happy!” too, if you send for this system. A full-size fold out set of iron on transfers. This particular one is a lovely birds set, and I’m hoping to do something with one of them! 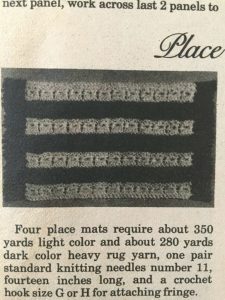 There are plenty of people who collect just these, and many of them are still available as “Aunt Martha’s” transfers. Plus there is one or two ads I’m hoping to track down and share. So plenty to do, but hopefully not to much! Here’s hoping I get all the projects done this month that I want. I know some of my followers are Workbasket collectors, I’d love to hear if you have this issue, and if you intend to make any of the projects featured! If you’re a follower who doesn’t collect the magazine I’d still love to hear your general thoughts about the issue. Next Post: That’s Right Folks! It’s a Jello Mold! Yes, I have that issue and I have made those foot warmers. 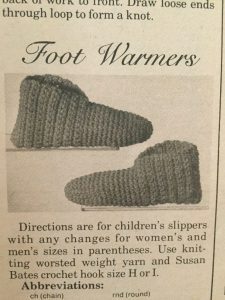 Now I may have to make another pair of those, since you have reminded me that I do have the pattern. I’d love to see them if you make a pair! I’m hoping to make some but haven’t started yet.